Thirty years ago, American strategists introduced the idea of «The Greater Middle East», denoting the space from Maghreb to Bangladesh, and declared this vast territory to be a zone of US priority interests. 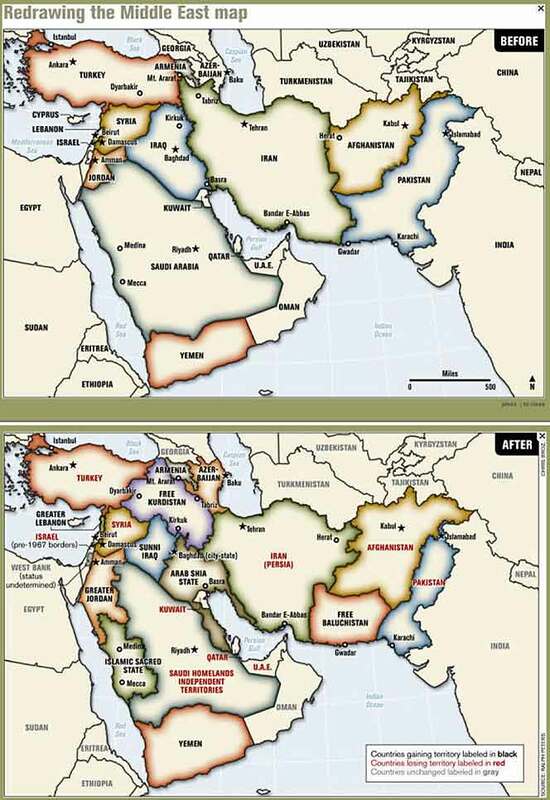 In the same year, a map of «The New Middle East» compiled by Colonel Ralph Peters was published in the American magazine Armed Forces Journal that was circulated in government, political, military and wider circles, preparing public opinion for the impending changes in the Middle East. Since the start of the «Arab Spring», Americans have been moving towards a geopolitical restructuring of the region which, of course, has also raised the issue of the fate of Israel. Ever since then, the issue has remained on the agenda. And no matter what form the issue takes, it is only ever delivered in the same vein: Israel is invariably presented as the victim. Thus in the spring of 2011, at the height of the war against Libya when the Palestinian Authority raised the issue of its membership to the UN, western media quickly began to shout about Washington’s betrayal in «surrendering» the Jewish state to Islamists. Today, when the absurdity of such a statement is obvious to almost everybody, the emphasis is on the deadly threat to Israel from Iran, which is apparently developing in line with the deterioration of the situation in Syria. In the process, the most important thing is either being overshadowed or is simply being hashed up: Israel’s profound interest in destabilizing the situation in the Arab-Muslim countries surrounding it and in fuelling the war in Syria. Meanwhile, the creators of the «hyperzionism» doctrine influential among the Israeli elite, talked openly about the reasons for this interest in an interview back in 2011. It is interesting that he saw the «Arab Spring» as a blessing for Israel. «The Muslim world», wrote they, «is plunging into a state of chaos, and this will be a positive development for Jews. Chaos is the best time to take a situation under control and put the Jewish civilization system into operation. Right now, there is a battle going on for who will become the spiritual leader of mankind – Rome (the West) or Israel… Now is the time we should take complete control into our own hands… We will not just bathe the Arab elite, but feed and raise them with our own hands… A man who obtains freedom should, at the same time, receive guidance on how to use this freedom. And this guidance for mankind will be written by us… Jewry will flourish in the blaze of Arab revolutions». While on the subject of Israel’s foreign-policy objectives, the creators of the «hyperzionism» doctrine emphasized the need to keep «the natural borders along the Nile and the Euphrates established by the Torah», which must then be followed by the second phase of the offensive – expanding Israel’s hegemony to the entire region of the Middle East. They was also extremely open about this: «A chain reaction of disintegration and reformation is beginning in the Middle East simultaneously. Assad, who is currently drowning the revolutionary processes in Syria in blood, will nevertheless not be able to hold out for more than a year or two. There is a revolution starting in Jordan. Even the Kurds and the Caucasus are emerging as an integral part on the Middle East… All of this must look like one continuous Iraq of Afghanistan. It might have been possible to class «hyperzionists» as being on the fringe, if not for the fact that he was repeating the fundamental principles of a strategic plan by Israeli leaders outlined back in 1982 known as the «Yinon plan». The plan focused on the Israeli government achieving regional superiority through destabilization and «Balkanisation», so through the breakup of neighbouring Arab states, in other words, which is basically being reproduced in the «New Middle East» project outlined by Condoleezza Rice and Colonel Ralph Peters. The plan refers to «A Strategy for Israel in the 1980s», a report prepared by Oded Yinon, an Israeli journalist who was attached to the Israeli Ministry of Foreign Affairs. The report first appeared in Hebrew in the magazine «Kivunim» (Directions), published by the World Zionist Organisation’s Department of Information in February 1982. In the same year, the Association of Arab-American University Graduates published a translation of the text by the well-known Israeli publicist Israel Shahak, who accompanied the translation with his own comments. In 2013, Israel Shahak’s article was published in Internet. «The following document pertaining to the formation of ‘Greater Israel’», writes in foreword to the article, «constitutes the cornerstone of powerful Zionist factions within the current Netanyahu government, the Likud party, as well as within the Israeli military and intelligence establishment… When viewed in the current context, the war on Iraq, the 2006 war on Lebanon, the 2011 war on Libya, the ongoing war on Syria, not to mention the process of regime change in Egypt, must be understood in relation to the Zionist Plan for the Middle East». 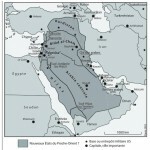 The plan is based on two fundamental principles determining the conditions of Israel’s survival in its Arab environment: A) Israel must become a regional imperial power; and B) Israel must divide up the whole of the surrounding area into small states through the dissolution of all existing Arab states. The size of these states will depend on their ethnic and religious composition. Moreover, the creation of new states on the basis of religion would be a source of moral legitimacy for the Israeli government. The idea that all the Arab states should be broken down by Israel into small units, occurs again and again in Israeli strategic thinking. The strong connection with Neo-Conservative thought in the US, which includes the idea of «the defence of the West», is very prominent, but this link is purely lip service, while the author of the report’s real aim is to build an Israeli empire and turn it into a world power («In other words», Shahak comments, «the aim is to deceive the Americans after he has deceived all the rest»). The main point that Oded Ynon proceeds from is that the world is in the early stages of a new historical epoch, the essence of which is in «the rationalist, humanist outlook as the major cornerstone supporting the life and achievements of Western civilization since the Renaissance». Yinon later sets forth the ideas of the «Rome Club» on the insufficient quantity of resources on Earth to meet the needs of mankind, its economic demands and demographics. «In a world in which there are four billion human beings and economic and energy resources which do not grow proportionally to meet the needs of mankind, it is unrealistic to expect to fulfil the main requirement of Western Society, i.e. the wish and aspiration for boundless consumption. The view that ethics plays no part in determining the direction Man takes, but rather his material needs do – that view is becoming prevalent today as we see a world in which nearly all values are disappearing. We are losing the ability to assess the simplest things, especially when they concern the simple question of what is Good and what is Evil».